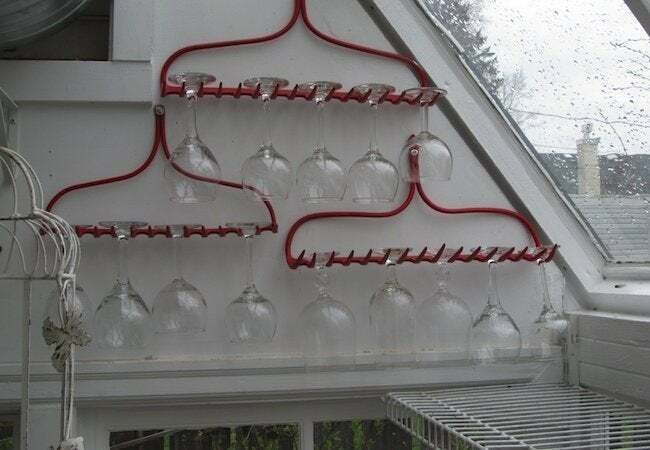 When your rake can rake no more, put it to practical or decorative use with one of these clever repurposing projects. What good is a rake you can no longer use in the garden? Actually, there are countless ingenious ways to give a second life to outdoor tools that have become inadequate for their intended purpose. 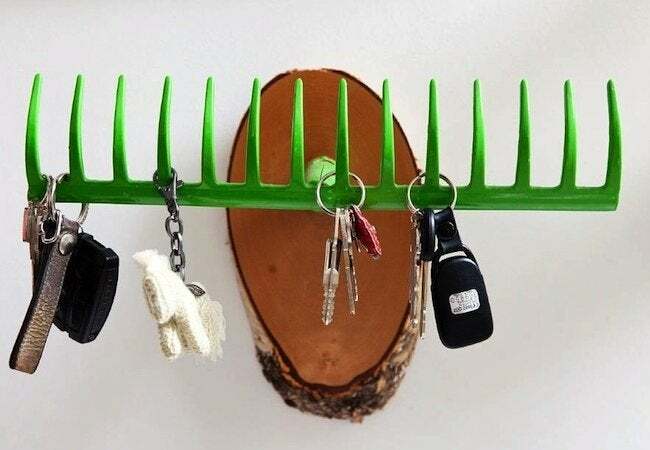 So before disposing of a trusty old helper that doesn’t help much these days, spend a minute looking over these repurposed rake projects from around the Web. Each suggests that with creativity you can make something useful and beautiful, even out of a rake with rusty tines or a broken handle. Always losing your keys? Try making this repurposed rake project—an organizing station perfect for the entryway. To make one, separate the handle and head of a bow rake. Paint the rake head in your favorite hue, then fasten it to an attractive backing that’s suitable for mounting—here, crosscut wood does the job beautifully. 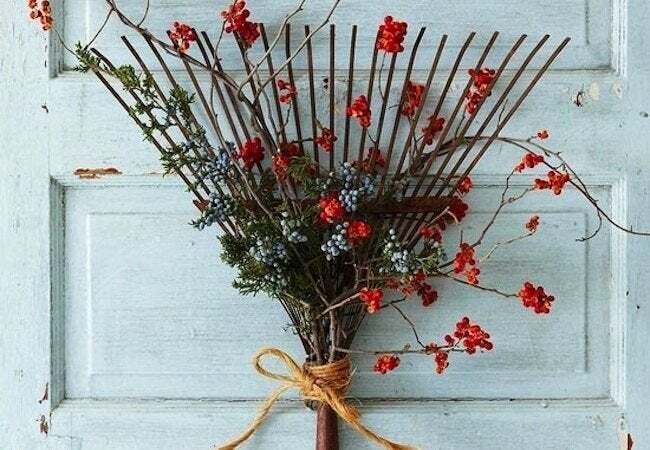 If you own a rake old enough to be if not beautiful, then visually interesting, consider repurposing the tool as the basis for an offbeat door wreath. Ornament it throughout the year with seasonally appropriate flowers, leaves, branches, or berries. Remember to keep it lightweight, though, so it hangs easily with wire. 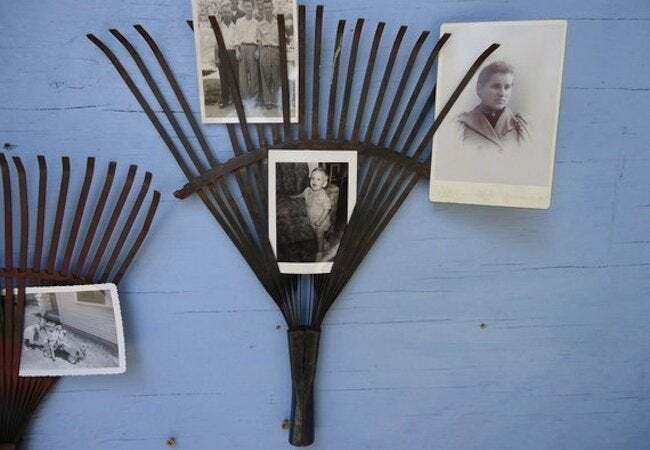 Here’s a great repurposed rake project for anyone who loves farmhouse-style decor: Use the tines of a lawn rake to hold photographs, postcards, and other printed keepsakes you wish to display. Show off several priceless mementos on a single rake head, saving the cost of as many store-bought picture frames. These rake heads, painted firehouse red, look so natural storing wineglasses, they almost seem as if they were destined for that very purpose. Mount yours with a combination of washers and screws; just remember that to support any considerable weight, the rake must be fastened to a wall stud. There’s a certain poetic justice to the idea of repurposing a rake outdoors; after all, that’s where the tool was meant to be used. 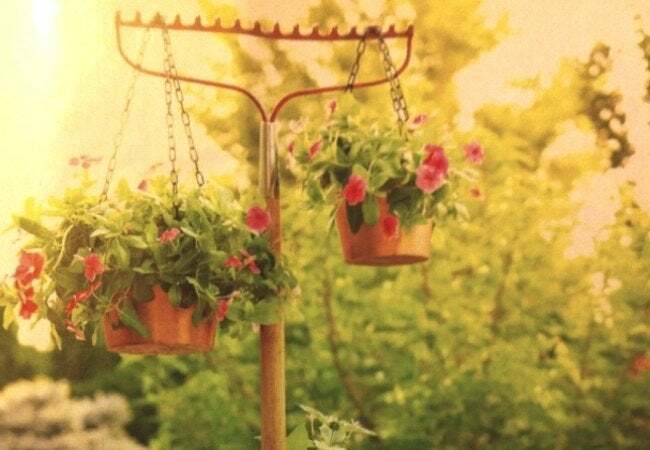 In this case, rather than collecting leaves on the lawn or tilling flower bed soil, the rake is staked into the ground with a couple of hanging plants suspended from its rigid tines.